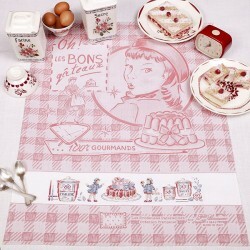 V.Enginger's Tea towels There are 76 products. 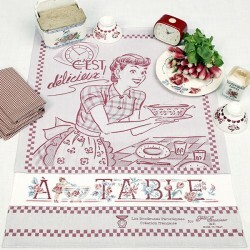 This tea towel is made from 12 count 100% linen. It measures 73 cm by 51 cm. Threads and needle are not included. 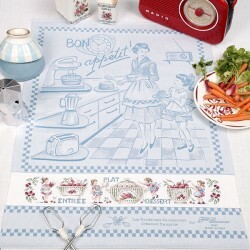 The pattern (symbols and colours DMC) and colour chart are included with the tea towel. Made in France. 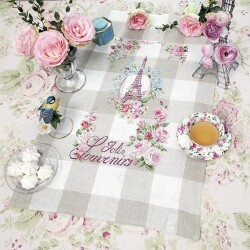 A touch of French elegance for this large 100% natural linen tea towel, enhanced with a cherry red check pattern. 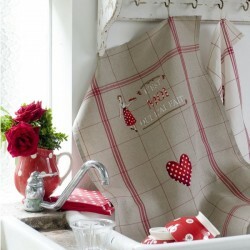 Embroider with love and display in your kitchen to impress your friends! It is embellished with a small loop for hanging. 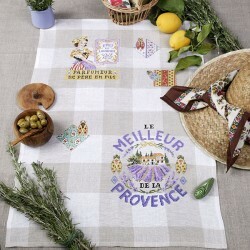 This tea towel is in the very attractive tradition of those old fashioned postcards that are full of gentle romanticism; you can embroider it with the most exquisite rose petals intertwined with forget-me-nots while you hum that oh-so-romantic Edith Piaf song, ‘la Vie en Rose’ to yourself. The embroideress’s dreams are sure to come true ! All Brittany in one towel! You are fond of sardines quiberonnaises? Do you prefer those of Belle-Ile en Mer? 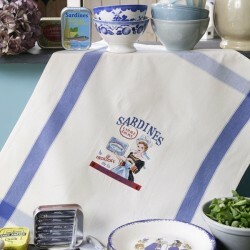 Whatever your favorite sardine is, you can show off your passion with this lovely girl from Brittany! It is well known, the best of Brittany is ... the SARDINE!